Jared seems to be having a great time at PAX East, and after all that, he still found time to talk to one of the designers of Deus Ex: Human Revolution Director’s Cut. He gave Jared some insights on the changes being made to the port, many of which were fan complaints. First and foremost, the boss battles are being revamped. Boss battles were a big issue for the original game: while all the levels allowed you to tackle the obstacles any number of ways (stealth, hacking, brute force, etc. ), the bosses required the player to use brute force. For those focusing on other areas of expertise, the bosses didn’t give them the proper Deus Ex experience. The designer also mentioned that Eidos Montreal changed some of the level layouts, which I would assume is for the same purpose: to give the player the proper Deus Ex experience where the original may have been lacking. 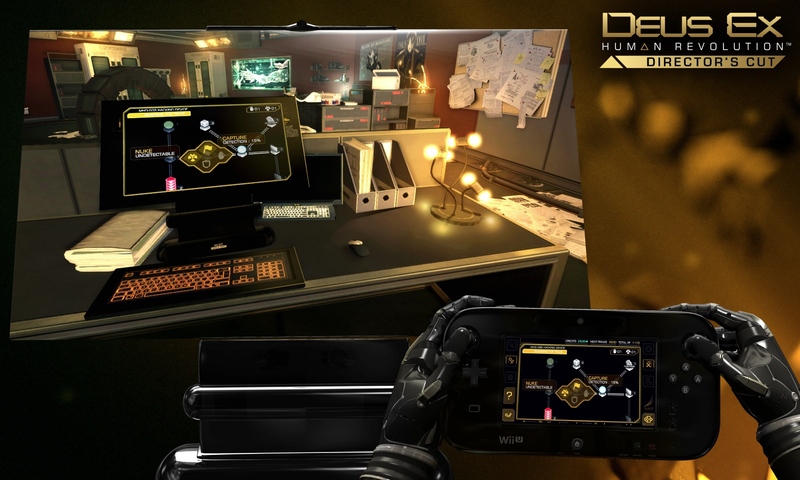 Second, Deus Ex: Human Revolution Director’s Cut also has some new Wii U GamePad features. From what Jared could gather, the GamePad is used for viewing the world through Jenson’s eyes. The example used at PAX East was Jenson’s ability to see threats through walls. In the Director’s Cut, this is accomplished by holding the GamePad to the TV screen. However, this mode also gives new insight into enemy statistics, such as health, ammo, and any items the enemy is carrying. Plus, the hacking mini-game now happens on the GamePad, while the game itself keeps going in the background. That’s sure to add some new tension to hacking. There are also minor updates like… new achievements? I assume this is in reference to the new Miiverse features, like screenshot sharing. At any rate, Deus Ex: Human Revolution Director’s Cut looks to be worth the wait for Deus Ex fans with a Wii U. Its release date is still to be determined, but you can preorder it at Amazon here. Next Post:Mother 2 Billboards in Tokyo?